1. Trump rally rolls on: It's shaping up to be another record-setting day. The Dow Jones industrial average, S&P 500 and Nasdaq each hit new all-time highs on Monday as traders anticipate business-friendly policies that may be implemented by President-elect Donald Trump. Based on premarket trading, it looks like the rally could continue Tuesday. 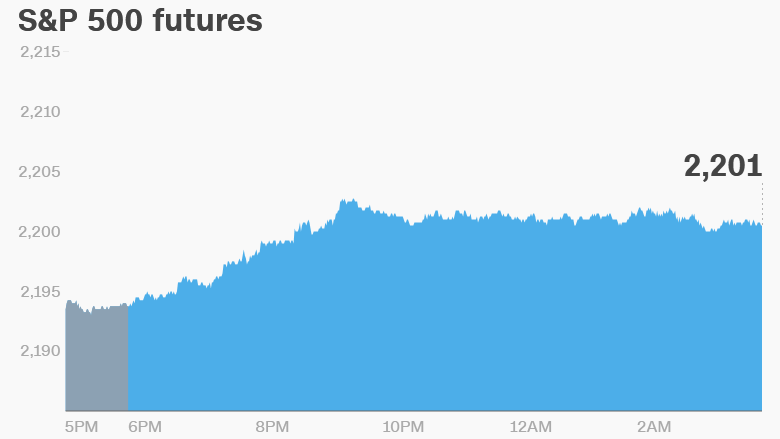 U.S. stock futures are all pushing up. "Donald Trump's reflationary economic plans of cutting taxes, infrastructure spending and less regulations remain ... the number one reason fueling stocks' gains," said Hussein Sayed, chief market strategist at FXTM. Nearly all European markets are also in positive territory in early trading. And every single Asian market closed the day with decent sized gains. Japanese investors are also relieved after a strong earthquake in Japan didn't seem to cause major damage. 2. Eye on commodities: The commodities sector is helping to power stock markets higher. Crude oil futures are up about 1.5% to trade around $49 per barrel, and gasoline futures are also surging by as much as 4.5%. Copper, zinc, gold, silver, nickel and aluminum are also moving up, with some commodity prices rising by more than 1%. Many large mining firms are rising by as much as 5% in Europe as commodity prices surge. Anglo American (AAUKF) in London is among the main gainers. 3. Earnings: Barnes and Noble (BKS), Campbell Soup (CPB), Dollar Tree (DLTR), DSW (DSW) and Hormel Foods (HRL) are releasing earnings before the open Tuesday. GameStop (GME), HP (HPQ), Hewlett Packard Enterprise (HPE) and Urban Outfitters (URBN) are set to release earnings after the close. 4. Asian airline goes bust: Troubled Taiwanese airline TransAsia said financial woes have forced it to shut down following two deadly crashes in the space of two years. TransAsia Chairman Vincent Lin announced on Tuesday that the company will be dissolved, leaving thousands of customers in the lurch. Its stock was traded on the Taiwan Stock Exchange. TransAsia made headlines around the world early last year when one of its planes was caught on camera clipping a bridge and plunging into a river in Taipei. The crash killed 43 people and prompted aviation authorities to come down hard on the company.